If there was anything I wasn't prepared for after having a baby, it was the long road to postpartum recovery. And I don't think I'm the only one. In the days and months leading up to the birth of your little one, you spend all of your time focusing on prenatal care and preparing for your sweet baby's arrival. Little or no thought is given to how your body will feel after giving birth. And let me tell you, it isn't an easy road. Muscles are stretched, tired, and sore; hormones are all over the place, making the simplest thing seem colossal; and tearing, bleeding, and swelling leave you very uncomfortable...and sometimes downright embarrassed. It's an interesting place in life, because while you're overjoyed to have your baby in your arms, surrounded by visitors and loved ones, it's also very easy to feel overwhelmed, frumpy, and unattractive. That's why I love using natural remedies for physical and emotional relief. Some of my very favorite herbs, essential oils, and other natural products are wonderful for healing, lifting one's spirits, and relieving pain. Lavender is my all-time favorite herb. I've found ways to incorporate it into my everyday life, and love that one of its best qualities is that it is a natural astringent. 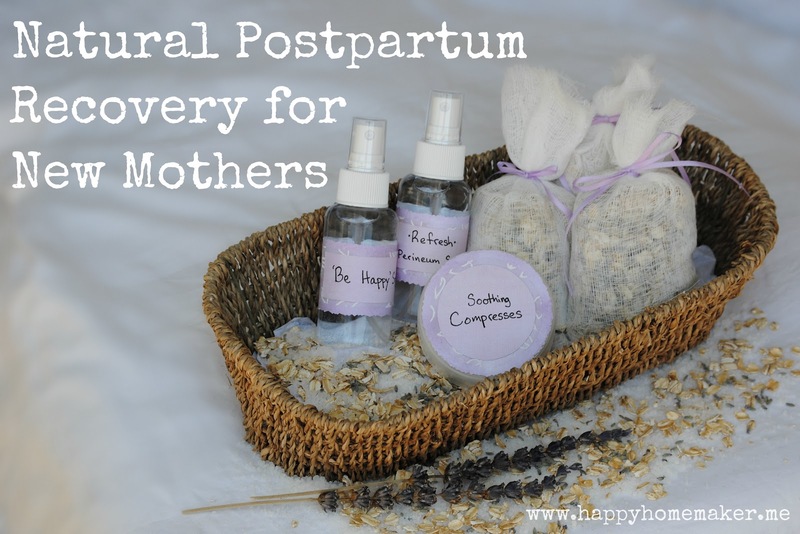 Along with its calming scent that can whisk away postpartum blues, lavender can also be used to reduce swelling, heal cuts, and soothing headaches. Oatmeal is wonderfully soothing and can be used to relieve itching and reduce swelling. It has also been used to ward off depression. When added to bath water, it works into a creamy milk that leaves your skin soft and smooth, free of itching and irritation. Witch Hazel is a natural remedy to cleanse a torn perineum and reduce itching at the same time. It works to repair open wounds, kills bacteria, and leaves your skin refreshingly cool. Tea Tree Oil is a natural oil derived from the leaves of the Melaleuca plant which is native to Australia. I has been used for centuries to heal cuts, burns, and infections. Aloe Vera is most commonly used as a treatment for sunburns, but its healing properties go far beyond that. Aloe Vera soothes irritated skin, helps cuts heal, and aids skin in retaining water for better healing in the future. Over the next few days, I want to share with you how I assembled this care package for a dear friend of mine who just gave birth to her sweet little girl. ♥ Lavender Oatmeal Bath Sachets--A soothing combination of Epsom Salts, Lavender buds, and steel-cut Oatmeal all beautifully packaged in a homemade cheesecloth sachet. ♥ Refreshing Perineum Spray--A gentle spray made of Lavender and Witch Hazel to relieve itching and swelling. Whether you prepare these natural remedies for yourself or a friend, I hope that these simple tips will help smooth the way to a pleasant recovery. What a great gift idea for new mothers! I'm going to send this to all my friends. Thank you! I'm working on my own kit for a friend right now.